Complete website solution, including consulting, online business strategy, web design concept, programming development, flash elements, content research & writing, SEO, Internet marketing, tracking & monitoring, domain, hosting. Newly re-positioned Melbourne-based Envirofleet Corporate Transfers approached Web-Conceptions to take care of their entire online business needs. The client knew all too well that a website would be fundamental towards creating positive hype about this new environmentally friendly business concept, increasing brand awareness and in turn boosting sales. There was very little doubt about the chances of success for such a business idea, as the world increasingly grows conscious about carbon emissions, responsibility and sustainability. Envirofleet offered the perfect solution for private chauffeurs, as well as corporate transfers; utilising hybrid Lexus vehicles and still off-setting all carbon emissions through partners Climate Friendly Australia. This web project goes above and beyond standard web design and development. Web-Conceptions actually became involved with the client's entire business model, working together to make sure that the company's reputation is launched and maintained as best possible online via its new website. This included full business strategies and market development. Marketing work included research and negotiations to set Envirofleet with off-set provider Climate Friendly, corporate brochures, promotions, public relations work, operational structure, and expansion plans. Indeed, a perfect example of a complete Web-Conception solution. One that goes far beyond freelance website development, and surpassing notions of customer service, care, innovation, creativity, practicality and success rate. 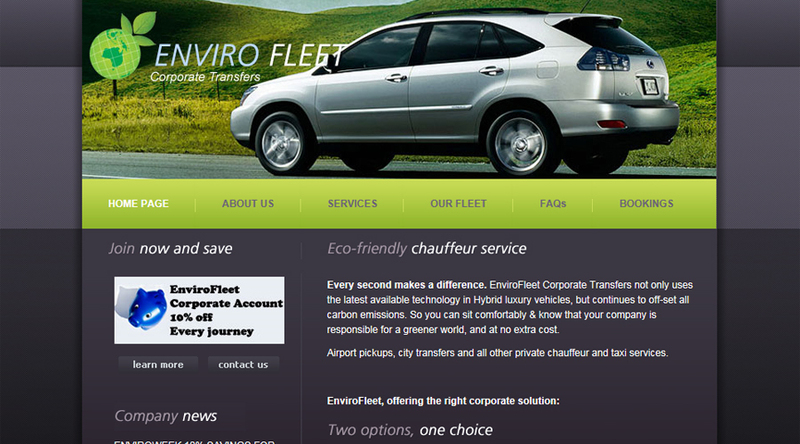 Envirofleet Corporate Transfers has thus far proven to be successful, and in more ways than one. Hits and visitors to the site have far exceeded its previous website, and by no comparison. In fact, the previous website had very few visitors per month, if any at all. No one could actually find it on the Internet; unless you searched the company's name (then known as Dimas Limousines), which no one would know. Now, numerous specific search on this industry lists Envirofleet Corporate Transfers in the first page - in Google, Yahoo, Bing, Ask. Some search actually feature Envirofleet in the first page two to five times. Any search phrases including the words "eco" "chauffeur" service or "Melbourne" is enough to do this; words that are no doubt the most relevant for the nature of this business, and words that potential customers and corporate clients would search with. This SEO success is pure organic (i.e. not paid Search Engine Marketing), supported by clean code, accurate titles, meta phrases and key words, deep and specific content, relevant back links and to other credible website sources, monitoring, Internet marketing and online PR. It has also not had any updates whatsoever - if it did, its ranking will no doubt increase even further. A remarkable achievement to say the least. Hundreds of returning and unique visitors on a daily basis, from around Australia and even around the world. Most importantly from corporate clients, including many major Australian companies and organisations. This has lead to many new corporate contracts and an overall dramatic growth in business activity. Even the likes of corporate Lexus contacted Envirofleet to offer their own customers special prices when using this corporate transfer service, as well as to link their websites and benefit from the excellent organic SEO.